I made a small order from beauty bay since I wanted to try out a few new products. I mainly picked up LA Girl products but added the Gerard Cosmetics Day All Day Setting Spray to my cart. I will be doing a full review on the foundation once I try it out more. The main reason I wanted a Beauty Bay order is because I wanted to try out the LA Girl Pro Coverage High Definition Illuminating Foundation. There are 13 shades in the collection and a white which is a lighter to mix your foundation. The packaging looks like the Makeup Forever Foundation and so far I am liking the finish. I chose the shade Fair which is for light skin with warm undertones and matches my winter skin perfectly. I had trouble finding swatches online so hopefully this helps some of you out. I would be an NC 20-25 in Mac or L'oreal Paris True Match Foundation W3. 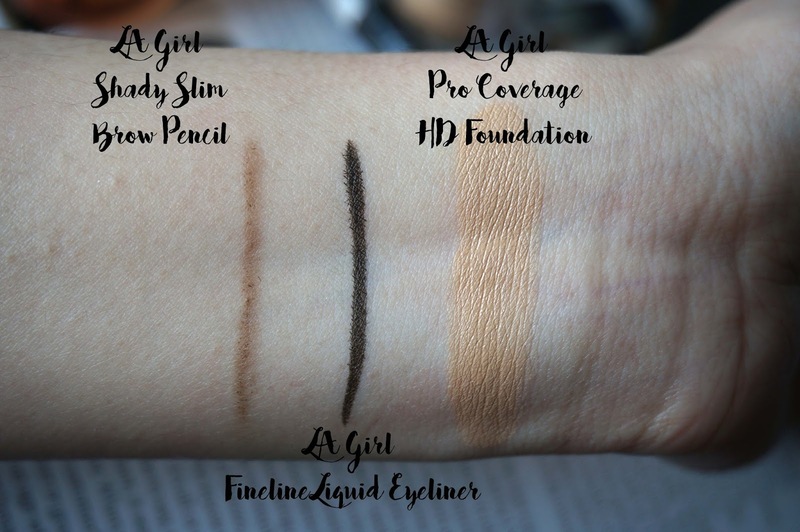 Another LA Girl item that I have been wanting to try out is their FineLine Liquid Eyeliner. It is a felt tip applicator and has a fine nib, it's easy to control but I do need more practice since my mini liner turned into graphic liner today. This is very affordable at £4 and compares quite well to the Stila Waterproof Eyeliner. I picked up a brow pencil from LA Girl Called the Shady Slim Brow Pencil and opted for the shade Medium Brown. This has a very slim lead, therefore, mimics hair like strokes really easily so if you are looking for a brow pencil that can create feathery brows this might be the one. It also has a spoolie end which is great for blending out the colour. Medium brown is a too light for my ombre hair so I need to get a shade darker. Lastly, I still haven't given up on the Gerard Cosmetics Slay All Day Setting Spray. The one I had was the Jasmine scent which does not smell nice at all so I don't use it anymore. The peach scent is so much nicer and keeps my makeup on all day. That is all for my mini order today, I'm really excited to share my next couple of post since my orders from the US has arrived. These all look so cool, I need to buy more beauty products, it has been too long.